Historic Mount Oread Friends is a tax-exempt fund devoted solely to the preservation and conservation of significant buildings, sites and amenities on the University of Kansas campus and promoting an aprreciation of historic spaces, places and events associated with the University of Kansas. 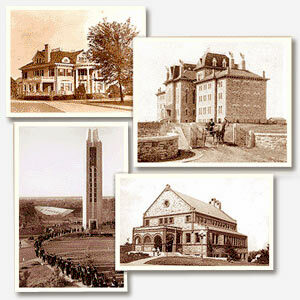 We work to preserve the historic and beautiful campus of the University of Kansas that generations have known and loved. Our goal is to ensure that KU's past is always part of its future. Historic Mount Oread is a nonprofit, all-volunteer organization that is part of the KU Endowment Association. We were founded in 1981 by friends of KU who were determined that the razing of historic Fraser Hall and other KU landmarks in the 1960s not spread to any more KU landmarks. We are the only historic preservation organization whose central mission is the preservation of the architecture and the open spaces of KU's historic old campus, inlcuding the Jayhawk Boulevard corridor, the Campanile, Marvin Grove and Potter Lake. 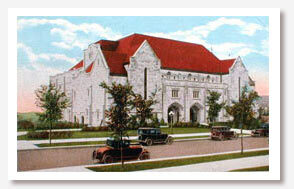 We are working with KU toward the establishment of a National Historic District in the heart of campus. If we succeed, this district would attract national attention to KU's beautiful campus and be a giant step toward its preservation for future generations. What gets preserved, or fails to get preserved, in the next decade will shape the campus for the next century. Tax-deductible contributions may be made in our name to the KU Endowment Association, P.O. Box 928, Lawrence, KS. 66044-0928. New members receive a complimentary copy of "Historic Mount Oread," with its photos and histories of KU landmarks. You'll also be invited to our spring and fall meetings at KU. Please Join Now!